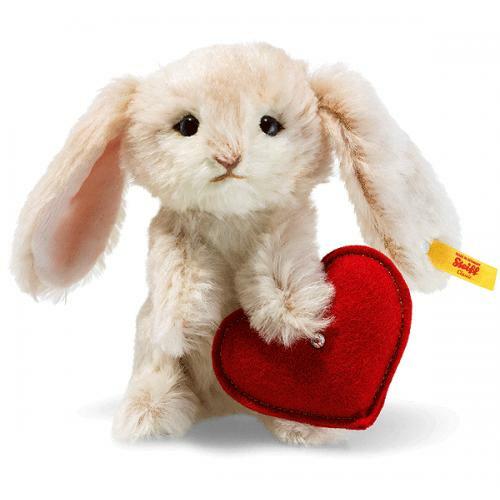 Rabbit With Heart by Steiff is hand made in beautiful cream mohair and wears the famous Button in Ear trademark along with the Yellow label. Rabbit holds a Wool Felt heart with small Chrystal on the front. Held by stitches to paw. The Rabbit with heart measures 14 cm and fits in any handbag, suitcase or backpack and is a faithful everyday companion or when its owner travels. The cream coloured fur is made of the finest mohair. A wonderful crystal from Swarovski is fixed to the heart.